Sebelum ni samsung dah keluarkan vm-hmx10a (4gb) dan vm-hmx10c (8gb). Pengeluaran vm-hmx20c (20c) pada kali ini diikuti model vm-hmx10c (10c). -berikutan peningkatan resolusi, nilai pixel bagi cmos juga telah ditambah: (10a/10c: 160 megapiksel, imej pegun maksimum: 2,048x1,536; 20c: 640 megapiksel, imej pegun maksimum: 3,264x2,44 . - Tiada getaran, Dual IS! Cover tu dp stainless steel, nampak slick dan moden. Cool! 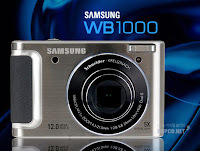 Reputasi: 0 Preview Samsung WB1000! Reputasi: 0 [Haptic ST10] Kini Ianya Haptic Untuk Kamera Digital! - Not only works as digital camera but also as MP3 or PMP. - a metal body with hairline finish and a lens cover. - inner zoom lens supports 3x optical zoom and F3.5-F4.5. - a speaker for movies and music, power and shutter button (don't have mode dial). - On the side, has a 20PIN integrated connector through which you can connect earphone, A/V cable, and USB cable. And there s a strap loop next to the connector. - At the bottom, there s a hole for holding tripod, and a battery holder next to that. - If you open the battery holder, you can see SD card and battery. SD card guarantees up to SD 4GB and SDHC 8GB. Battery is SLB-0937(900mAh), which can last for 260 photos, 130-minute video recording, 330-minute MP3, and 190-minute PMP. - Most of ST10 s functions can be set on the LCD - software type mode dial appears when you select icon on upper left side, and you can pick a mode you want by touching. - ST10 uses 3x optical inner zoom lens. "The WB1000 (TL320) is targeted at enthusiasts. The 12-megapixel WB1000 (TL320) will come with a 5x optical zoom lens and a 3-inch AMOLED display, the largest of such a screen to be incorporated into a digital camera. The two analog gauges on the top display the remaining battery and memory capacity (onboard and memory card)." Reputasi: 0 Tulip Lamp dengan Samsung IT100 (SL820) - Perfect Picture, Everytime! Reputasi: 0 Apakah Saat Terindah yang Paling Kita Ingin Rakam & Simpan? "Digital camera war has started. Beginning with the first quarter, which could be said A match among the companies, every kind of digital cameras have been pouring into market. And the Korean leading company Samsung Digital Imaging Co., Ltd is introducing stylish and simple ST50. Cameras have been a means for people to express and prove themselves; from formal and stiff black-and-white family pictures taken with films cameras to funny self-portrait pictures taken with digital cameras. They have been the common recording device for a long time and the technology has developed constantly. As the technology develops, engineers confront a big question. “What is the most memorable moment that people want to keep the record of?” In order to figure out and satisfy consumers’ desire, many engineers developing camera technology have put much thought into useful functions for portable digital cameras. And one of the conclusions from it is ‘portrait-centered technology.’ ST50 of Samsung Digital Imaging Co., Ltd has made with that consideration on basis, so it helps take various portrait shots more easily, quickly, and stylishly.[...]" gambar HDR diproses pakai software pc atau internal di kamera ? bisa minta spesifikasi samsung NX ? sample pic ? […] The foundation of a separate camera division […] which will focus solely on digital camera business as of February 1st had already been revealed. Additionally, the development of the new NX concept has naturally continued, and during the PMA show in Las Vegas we will be able to hear about its features. With the arrival of the Micro Four Thirds system, the solution seemed to be within reach. […] With this model, Samsung tries to steer hope in a certain direction. 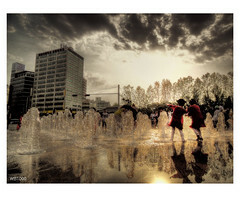 However, with the introduction of the Samsung NX camera, the game is not yet over. boleh layari blog http://darikacamatalensa.blogspot.com untuk lebih info. Tinggal nunggu keseriusan Samsung menggarap segment Digital Imaging ini. Salah satunya adalah line up lensa Schneidernya. Karena sangat langka sekali yang menyediakan lensa ini di manapun. This little SD camcorder is appealing, thanks to its compact aspect, its design with a glossy finish by Samsung or to its 10x lens coupled with very handy functions. Crystal Gloss finish is on the agenda for this very cute camcorder. This shiny gloss paint has become the brand’s signature, a successful design for this little camcorder with flash memory, available in 2 versions: SMX-C10CP for the "platinum black" and SMX-C10RP for the "vibrato red". It is very compact as it has neither disk nor hard drive: the SMX-C10 records on SD or SDHC memory cards. The glossy vibrato red finish is rather successful! No hi def here but SD-VGA in 640x480 pixels at 30 fps or SD D1 in 720 x 576 pixels but with a very fluent 50 fps! Without HD and encoded in H.264 HP/MP4, videos from the CP10 don’t take up much space: on a 16 GB SD card, 6h20 of video will fit in with its best image quality. By the way, Samsung also announces a battery life of 2h40, which puts this camcorder in a good rank among the most enduring digital camcorders. The "Timelapse" function is worth noting: it allows taking an image every 1, 3, 5, 10, 15 or 30 seconds then view them in-a-row as a movie. This type of mode is brilliant for filming clouds moving, sunset or a flower blossoming in slow motion then watches the scene more quickly. Stereo sound, no surround, simple definition image, no HD: the Samsung is a handy little camcorder (2,7" 230 000 pixels swivel screen), with a strong battery life and rather good value. Its fully takes responsibility for its ‘gadget’ aspect, with this button upload directly on YouTube the videos captured with the SMX-C10. Handy for fans of video sharing on the Net, it will save a lot of time, all the more so as the basic editing functions can be performed directly on the camcorder. So to transfer your videos on YouTube you only have to plug the camcorder to a computer via the mini-USB port and push the dedicated button. Besides, the SMX-C10 is recharged via the USB port, very handy! Here in its "titanium black" outfit, we notice the lens 25°-upward lens for a less tiring position when shooting. Available at the end of May 2009, the digital camcorders Samsung SMX-C10CP (platinum black) and SMX-C10RP (vibrato red) will be sold 199 euros VAT incl. you may also have to buy an SD card to store your videos. sudah tentu Samsung sedang melakukan sesuatu demi memenangi hati pengguna setianya. samsung juga sudah ada menyediakan kamera yang menggunakan lensa Schneider dan setakat ini review yang diterima sangat baik. harapnya samsung akan lebih menambah baik model kamera dan kamkodernya kerana pastinya pesaing-pesaingnya turut tidak mahu ketinggalan. "…] The Quick Menu button on the LCD provides access to a few frequently used functions, including switching shooting resolution, plus manual configuration of white balance, exposure and focus. 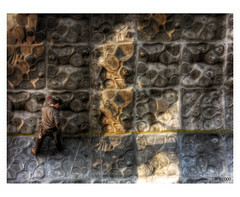 There are two white balance presets each for indoor and outdoor conditions, plus the usual auto and custom modes. The exposure control has nine levels, and there are two options for manual focusing. You can either use an onscreen slider, or a one-touch system. However, we found the latter one of the least effective versions we've used, having regular difficulty locking to the points we indicated on the LCD. 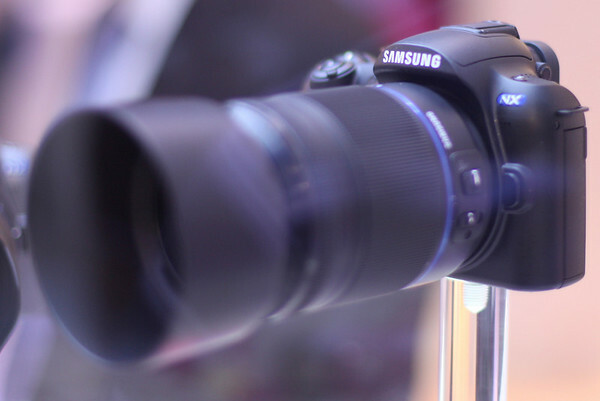 Samsung is clearly aiming this model at point-and-shoot consumers. To this end, the H104 also offers an Easy Q mode which disables both the Quick Menu and full menu. There is also a curious rotating grip, which appears to be designed so you can hold the camcorder like a torch, although you will then need to use your other hand to toggle recording. If you're shooting from the hip, this configuration does prove more comfortable than simply gripping the camcorder between thumb and forefinger, and you won't risk dropping it either. Flip off a cover at the rear, and a relatively comprehensive selection of AV ports is revealed. A small proprietary socket hooks up to a breakout cable offering component analog video and RCA audio connections. There's also HDMI available, but as always it's of the mini variety and no adapter is supplied in the box. The mini-USB connection resides here as well. Unlike most other mainstream manufacturers, Samsung doesn't use the AVCHD format for its camcorders. Instead, it relies on MPEG-4 AVC H.264 with an MP4 file format, which is allegedly more standards-compliant than AVCHD but in reality we found it caused problems with Adobe video editing software. Fortunately, Samsung has taken a leaf out of the current trend towards video sharing camcorders, and has bundled an app called intelli-studio, which installs from the camcorder itself. This provides some very basic editing capabilities, plus one-step upload to YouTube." There're 9 photo styles, so you can take pictures in many different concepts. However, it is not actually frequently used." […]Assuming that the APS-C sensor is a true 1.5x crop sensor, the lenses should follow the standard range for other systems (e.g., 18-55mm, 55-200mm, and possibly a 30mm or 50mm pancake). Each of the zoom lenses featured two switches on the side, which I would assume activate autofocus and image stabilization, respectively. 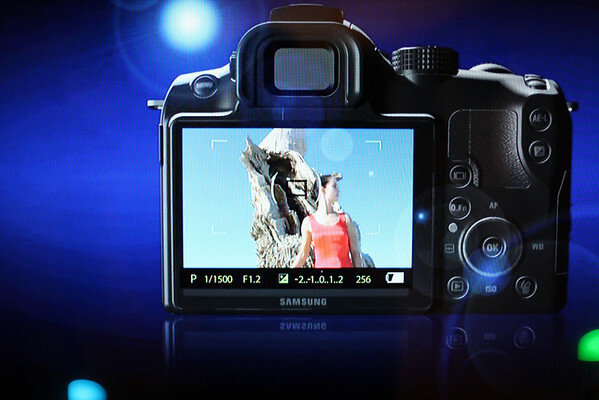 However, that seems a little off mark for Samsung given the use of the sensor-based image stabilization in the GX-20. Keep in mind this is simply guesswork and the use of those deductive reasoning classes I once took. The price point is not yet set (or, perhaps “revealed” is a better word). Back to quasi-facts: Initially, Samsung will launch a single NX series model and hopes to have more in the works by PMA 2010. This initial launch will probably take place in July 2009; however, it should definitely occur in the second half of 2009. Additionally, Samsung is planning on shipping the new NX model by the end of 2009." "Baby's first steps? Daughter's graduation? Important life events deserve to be filmed and watched in beautiful high definition. The HMX-HM100 boasts 1920x1080 resolution which means you’ll see every amazing detail in brilliant color. It also comes with 10x optical zoom so you can get close to the action and optical image stabilizer for blur-free video." Hello dimana bisa dapatkan Samsung WB550 di Jakarta ? "HMX-H106 series have equipped SSD (Solid-State Drive) for the first time in the world. It supports 1920x1080i Full HD based on 1/4.5 inch CMOS sensor. In addition, it has 180° rotating full angle grip and easy-to-use built-in software Intelli-studio. It is a home camcorder with various high-quality features. The models released in Korea are H106 (64GB), H105 (32GB), and H104 (16GB). It will have different capacities. […]Other than that, the specifications are same; Full HD recording, 10x optical Schneider zoom lens, optical image stabilization, interval recording, etc. In this review, let’s find out about how H106 series is differentiating itself from other competing products." * Review ini berdasarkan model H106, dan sampel dan foto diambil menggunakan H104. "The best way to relive special moments is by watching them in amazing high definition on your HDTV. The best way to do this is with the SAMSUNG HMX-H106 camcorder. 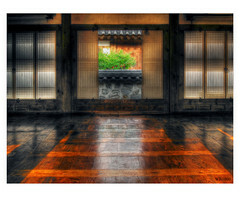 It offers 1920x1080 resolution which delivers breathtaking detail in brilliant color. It also includes 10x optical zoom so you can get close to the action and optical image stabilizer for blur-free video." * Beauty Shot/ Face Detection/ Self Portrait/ Smile Shot/ Blink Detection"